'The CherryCart' is a unique Pre-school & Daycare having two centres close to Manyata Tech Park, one at Verannapalya & the other at Tannisandra. 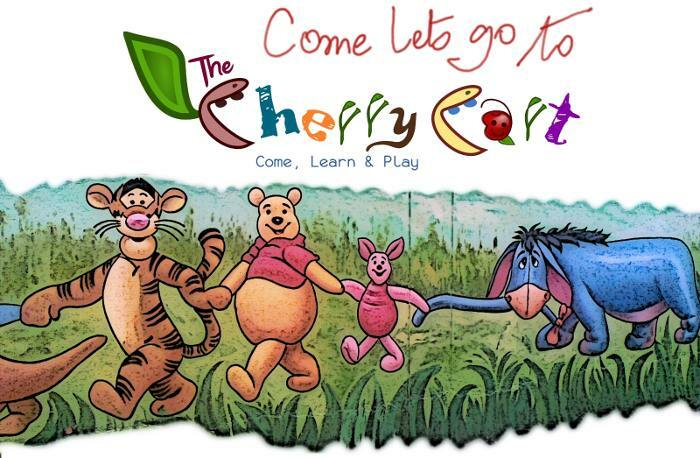 The CherryCart was started in year of 2010 with an objective of creating a homely environment for kids giving them the best care and developing them holistically - using activity based learning methods. Our Mission is to provide safe, affordable, high quality child care for the kids of agegroup 5 months to 10 yrs. Our focus is to provide a stimulating early care and education experience which promotes each child's social/emotional, physical and cognitive development. 'The CherryCart' is committed to the families we serve, providing support and encouragement at all levels. We, at CherryCart, pride ourselves in maintaining professionalism while at the same time creating a warm & loving environment for everyone who enters our facility whether it is our staff, children, parent or visitors. But above all our children are our top most priority and we constantly endeavour to create the best environment we can for our children. We believe in personalized education where learning is made fun through the play-way method. Our concept and the philosophy have emanated from our deep sense of love and affection for the little ones and an understanding of the child psychology. The first five to six years of a child’s life last a lifetime!! Known as the early childhood years, this period is most critical for life-long development, since the pace of development in these years is extremely rapid.This early childhood stage is also important as a foundation for inculcation of social and personal habits and values, which are known to last a lifetime. These years are therefore crucial and important for investing in to ensure an enabling environment for every child and thereby a sound foundation for life. 'The CherryCart' as an “extended pre-school” addresses these early learning needs. Our guiding principle is to provide children with a stimulating and enriching physical and psycho-social environment, the right values, love and protection needed in the most critical phase of a child’s growing up years. We cultivate creativity and confidence in children with a nurturing approach in our Pre-School program. We are aware that health, nutrition and education/ psycho-social development are all synergistically inter-related, and hence we address the all round development of children through a holistic approach. 'The CherryCart' is committed to providing the highest standards of safety and hygiene and uses systems that are transparent. With an ardent zeal to work with young children and grow them together, in 7 years the small and dedicated team of CherryCart has earned huge customer validation as leading pre-school & daycare centre in the locality it operates in Bangalore. We thank you for taking time to review our website and hopefully you have learnt a little more about CherryCart. Hope to hear from you soon. CherryCart is one of the best Preschool and Daycare! Am so glad that my son's first school was Cherrycart! He still cherishes the times he spent there. Thanks to them he really enjoyes going to school! My kid was in CherryCart from 15 months of age. We were there only for 7 months after which we shifted to Mumbai. Now he is 2 years old but he still remembers all his teachers at CherryCart. Initially he resisted the new daycare as "No Going"! Later he adapted and settled very well and started loving his teachers at CherryCart. In fact, after we shifted to Mumbai and he started going to his new playgroup, he refused to go saying "No Mani madam; Reuben no going!". His attachment suprised everyone. Recently when we booked our tickets for a visit to Bangalore, to everyone's surprise, his reaction was: "I am going back to my cherrycart"! He hadn't forgotted anyone and was waiting to get back. I think that this 2 year old's reaction itself speak of the love and care he associates with CherryCart. Even I miss CherryCart -- special thanks for the co-operation in the last month when I was unwell. As for me, as a mother, CherryCart is symbolic of discipline, hygeine, values, love and care for children. I definitely recommend CherryCart as the best daycare. Just wanted to say thank you for your help in bringing up Aaira in such a wonderfull way. It was a big help, we were starting to panic. All of you helped Aaira so much she really learned a lot from all of you. This knowledge I know will & has given her a good foundation in which to start kindergarden. Aaira still talks about all of you whenever we talk about the daycare. Thank you so much for helping me also to concentrate in my work. I am grateful to my friend for showing me this daycare. Such wonderful care for my son! He has learnt to speak, and eat by himself!! He does not understand the concept of being fed!! He is actually put on weight after Cherrycart's menu!!!! Our daughter Pratiksha is in Cherrycart since she had turned 6 months. We were looking for day care where she will get same love and affection like in mom’s touch & lap . Luckily we found Cherrycart. Cherrycart has a trained nurse and employees to accommodate needs of kids. Now our daughter will be turning 3 yrs and she is going to Nursery. I am comfortable with way she is growing and exposure she is getting in Cherrycart. It was heartbreaking to have to leave our daughter with someone else after my Maternity Leave, but the staff at Cherrycart allowed me & my husband to go back to work with a sense of peace. Tashvi was left in Cherrycart when she was 7 months and now she turned to 11 months old. Tashvi was so loved from the first moment. I watched her grow and learn new things with the staff, but the most important thing for us as her parents is that she is safe with them. I am profoundly grateful to the staff for the care they give. at home, but priti and the teachers at CherryCart were very supportive and took all efforts to make her feel comfortable and eventually Sparsha started to love CherryCart. The one thing that we always appreciate about Cherry Cart is that they take into account parents views /concerns and take necessary steps to incorporate them. They also have gone out of the way to help us during crunchy times. Our daughter goes to Cherry Cart without tears in her eyes and while picking her she has so many things to share with us. This makes our life so very easy as we are assured that she is in safe hands. The Cherrycart day care is quite conveniently located and well managed. In our last three years of association with Cherrycart, we found Priti and her staff to be caring and flexible in handling the ever-changing needs of young children. With regards to my experience, I would just like to say that Cherry Cart provides all the essential elements a delicate bud needs to bloom into a beautiful flower. Enrolling our daughter at Cherrycart has been one of the best decisions me and my hushand have made! Since my daughter turned 2 years am sending her to daycare. But there was not even a day she waved me bye with a smile :( Few months passed by and I was quite confused whether to continue my job or not. Quite accidently on my regular route to office I saw a new placard with details of Cherrycart. Cherrycart has an environment where not only the kids but also the parents become part of a larger family through yearly sports and cultural events, birthday bashes and the excitement to celebrate all festivals is remarkable. The best part is the enthusiasm and quality of the events has only increased over the years.. Glad to know that Cherrycart also conducts classical dance classes starting this year. Nothing can be more comforting to a working mom, than to know her child goes to a place where she is loved and cared for. Your service is invaluable!! Being a single parent, I am always extra careful in choosing anything for my child. CherryCart happens to be one of the best choices I made to ensure that my daughter Rithika is in good hands. The care and concern of the teaching and support staff, the hygienic classrooms, kitchen and rest rooms, as well as the timely SMS messages about my child's meals - all ensure that I am able to focus on work knowing that she is in a safe and secure environment... having a lot of fun! Way to go CherryCart! Home away from home for Nived & Naman! Cherry Cart - Home away from home for Nived & Naman. Priti and her team have always risen to the occasion to ensure that the kids feel loved, secure and happy . Kudos to the entire Cherry Cart team! An amazing experience for my daughter! My daughter Nidhi is with "The CherryCart" since 2011. She really gets to explore and present her talents and be part of the school. This is an amazing experience for my daughter, who is our only child. I love CherryCart. The school is well-managed and small enough to accommodate special requests personally. Nidhi also really like the snacks and food. I also truly appreciate the diversity in staff ethnicity and culture. It brings different traditions together and helps kids explore other cultural elements as well as good values.